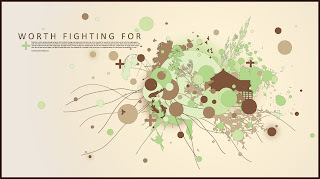 The second of a new series, Worth Fighting For. Butterflies, crickets jumping through tall grass. Red and black lady bugs and spiderwebs with dew drops in the morning. The song of the robin at dawn and the call of the nightengale at dusk. The blades of wheat dancing in the fields. A cool breeze. Swinging from the branch of a ancient oak tree; fallen leaves of red and gold and orange. Puffs of dust and drops of rain, the creak of an old forest and the rustle of high grass. The quite murmur of water running over smooth stones, the roar of a waterfall. An owl’s hoot, a wolf’s howl. The magic of the autumn wind, the hot days and cool nights. The sight of freshly fallen snow. The complexity of a snowflake. Frost on the grass. An unopened bloom on a wild flower; the perfection of a rose. This is a list of things that I wrote down one day that I feel are actually worth fighting to preserve. This is the beginning of a new series in a true representation of my new style. I tried to give the design an elongated form because I am trying the convey a substance, or infection if you will, that lives inside of people like a fear. I wanted to convey the terror that people from war-torn countries in Africa and the Middle East, etc. live with inside them every day. A fear that spreads throughout your body, extending to effect every part of your life and making every day miserable. 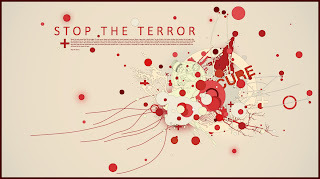 Thats my message with this design, that we have to Stop the Terror. This design is a compilation of a lot of elements into one organic, flowing shape. 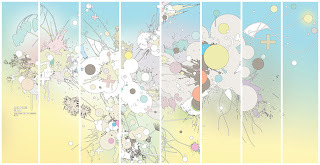 It was designed almost entirely in Illustrator and is meant to eventually be printed on wallpaper and put up in my house.